You have come to Reagent Central! Hope we can help you with your Reagent needs. This is the complete Reagent Dictionary. This will tell you where you will find them. Need to transmute, but you'd like to know what they require for certain reagents you need? 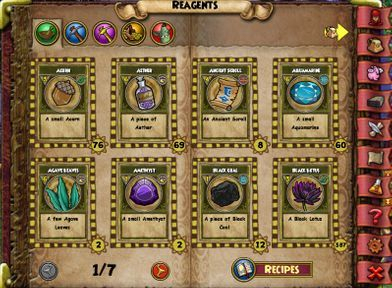 The new reagents were introduced in the Spring and Summer 2015 updates which are useful for Pet Jewels, Lava Aquarium and Jewel recipes. The new mote reagents were introduced in the Four Dungeons update which are useful for new decks which are found in Darkmoor as well as the new Tapestries for the Four Dungeons.